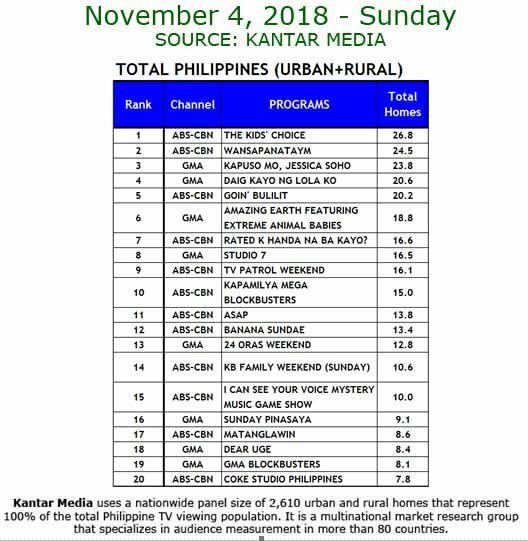 Regine Velasquez reigned for a second Sunday with her debut appearances in ABS-CBN shows as a certified Kapamilya, according to the nationwide ratings data of Kantar Media. On November 4, Velasquez was seen by fans in three programs - the musical variety show “ASAP,” which aired the second part of its Sydney special; the TV magazine “Rated K”; and “Gandang Gabi Vice,” which featured the continuation of the singer’s fun-filled interview. Replicating its win last week, “ASAP Live in Sydney” was the top program in its time slot, with a nationwide rating of 13.8%, ahead of the 9.1% share of its competing show. Despite airing late night, “Gandang Gabi Vice” managed a national TV rating of 7.3% — higher than its rival program’s 5.7%. “Rated K,” meanwhile, scored 16.6%, ranking it seventh overall as the most watched TV show in the country on Sunday. On social media, the three Kapamilya programs visited by Velasquez similarly made a splash, with each of the episode’s hashtags ranking among top trends on Twitter. At one point, three hashtags related to Velasquez ranked in that list simultaneously. Velasquez is gearing up for several new programs as a newly minted Kapamilya in the coming months.